GeoOp is a cloud based job management solution designed for businesses with a mobile workforce. Using this tool you can save time, fuel, paper and improve customer service. It's a Mobile App that can be installed on most devices (smartphones/tablets) combined with a web based administration portal. Once installed on your devices, the GeoOp App allows you to capture GPS location of that device, job photos, customer signatures, time/parts information, create and assign jobs, generate job sheets/quotes and email documents directly to your customer. You can see your team on a Google Map allowing you to create and assign jobs for them based on their geographical location. Your staff will receive job notifications on the GeoOp App on their smartphone/tablet and can then add additional information to the job (parts, time spent, payments, customer signatures, audio recordings and even photos of the job). Using GeoOp as your primary job management system allows you to see a live schedule of your team and their workload, run reports on jobs and get a live dashboard of what is happening across your mobile workforce. Remove Paper – with GeoOp you no longer need to rely on paper job cards that can be lost, have illegible handwriting, missing information and need to be physically sent/stored/shredded. You can have all the information you for every job captured and stored more securely in the cloud, searchable and accessible from almost anywhere. GPS Tracking – Use your smartphone or tablet’s GPS capability to better allocate staff based on their geographical location. This allows you to respond more quickly to customer requests, save fuel on unnecessary travel and lots of time. View your entire mobile workforce's past present and future locations in a familiar Google Map. 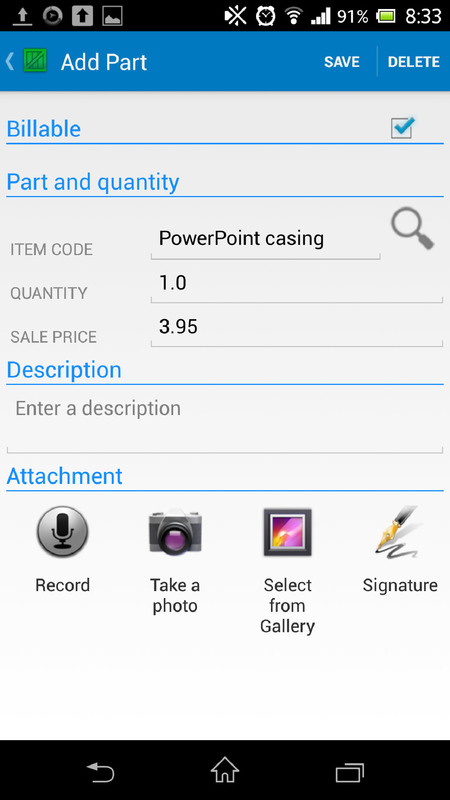 Capture photos– While in the field your staff can attach images to jobs. Capture before and after shots with every job, capture product serial numbers, site evaluation shots, safety incidents/hazards and more. These images will be visible on the GeoOp website within moments at the office. Digital Customer Signatures – Get that professional and modern look to your business by allowing your staff to use touch screen devices to capture customer signatures from customers while onsite. This is a great way to gain acceptance of work performed, satisfaction, invoice approval and more. Use the Built in Timer – you can either use the app’s built in timer for allocating staff time to a particular job or manually add the time yourself. This is great for teams that bill for labour/time. GPS Navigation to the job - When a job is created you can add the job address so when the assigned staff member receives the job, they press one button and GeoOp will direct them straight to the address. Reduce your Admin time and materials – With GeoOp you can receive a call from a customer and have a job added and allocated within moments. 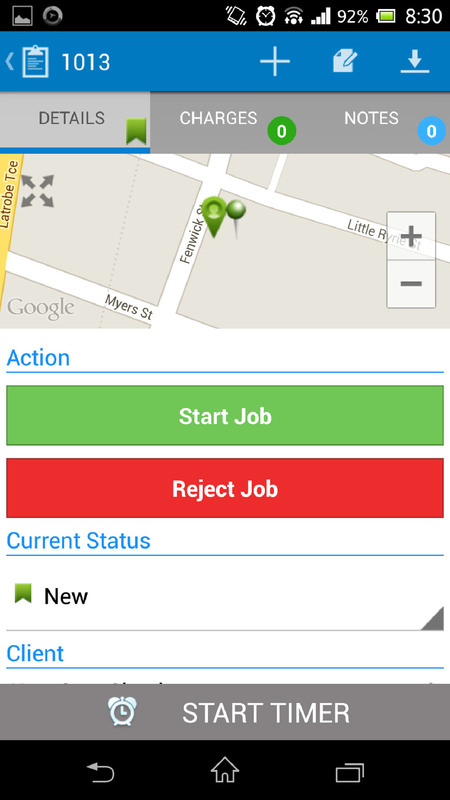 Once created, your staff will receive an App notification for the new job. When they open the job they will have access to location, time allocated, parts required, any schematics or other important information you or the office staff wish to add - all in one place. Less phone calls to and from. Less visits to and from the warehouse for parts. Automate your invoicing – used in in conjunction with popular cloud accounting software you can complete invoice runs in moments with a few simple clicks. Information stores in GeoOp is exported to your accounting system, saving you re-entering customer name, address, time/parts information and more. Company Schedule – view your staff schedule in one place so you can allocate jobs quickly and easily. Plan those big jobs with the ability to add multiple visits for any job. Assign one member to a job or teams of staff to work together with a single click. Access field information real time from in the office – when your mobile workforce add information while on the job, all these changes are visible on the web (eg: back in the office) so you know when a job has been started and when it's finished without having to call. It also saves a visit back to the office at the end of the day to deliver job paperwork and can speed up the time it takes for you to invoice your customers. Import your existing Parts List and Customer List – With GeoOp you can load your existing Customer List into the GeoOp system, allowing for fast searching of repeat customers (which pulls up their address automatically). Importing your Parts List to GeoOp lets you and your mobile workforce access to parts pricing and information. Improves your quotes and invoicing speed. Customise who has access – You have the ability to determine different permission levels so you can allocate who within your team has access to what data. This allows you to allocate jobs to a contractor without allowing them the ability to create jobs or access your Customer List. Use existing devices – The GeoOp Mobile App is compatible with major smart device developers including Android, iPhone/iPad, Windows Phone and Windows RT and can be used on computers with a web browser. Telstra Customer Case Study - Call Telstra Business Centre Geelong on (03) 5246 9900 and we can give you a demonstration on how GeoOp works face to face. Telstra Business Centre Geelong are your local GeoOp experts.